When most of us think of women in Afghanistan, we picture them hidden behind the walls of their homes and the folds of their full-body burqas. But it hasn't always been this way. Until the 1970s, the 20th century had seen relatively steady progression for Afghan women's rights. Afghan women were first eligible to vote in 1919, only a year after women in the U.K. were given voting rights, and a year before women in the U.S. were allowed to vote. In the 1950s, purdah (gendered separation) was abolished, and in the 1960s, a new constitution brought equality to many areas of life, including political participation. Afghan women had access to professional careers, university-level education, public transportation, public spaces, and shops selling nontraditional clothing--all of which they navigated freely without supervision. Then conflict took its toll. During the coups and Soviet occupation of the 1970s, through civil conflict between Mujahedeen groups and government forces in the 1980s and 1990s, and then under Taliban rule, Afghan women had their rights increasingly rolled back. Under the Taliban, they were banned from going to school, working, leaving the house without a male chaperone, or even showing their skin in public. Zarghuna is both old and young enough to have experienced both of these worlds. Zarghuna was born in Mazar City in 1971. Her father died when she was two years old, and afterwards her mother struggled to care for her and her older sister by working as a seamstress from her home. Zarghuna’s mother encouraged her daughters to attend school. Based on her efforts and performance, Zarghuna won admission to a government school and continued her education through the first year at university. At 20 Zarghuna was engaged, and at 22 she married. Zarghuna had always been interested in becoming a hair stylist. When she was a young girl, she saw a photo of herself and was appalled that her mother had paid no attention to her hair (the family did not own a pair of scissors). As she grew older, she began working on her hair by “twisting paper” into it to make it curl. Then she started doing the same for her neighbors--and making money at it. Not everyone approved of these activities. In traditional and religious families, “beauty services” are associated with prostitution. Yet these negative stereotypes did not slow Zarghuna’s progress. She worked hard to become a professional. In 2006, she went to India, then to Tajikistan and Dubai, to study and learn. 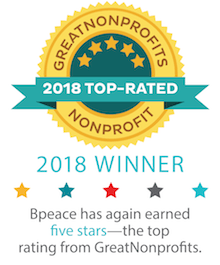 In 2011, through the support of Bpeace, she spent a week at the top-tier Bumble & bumble salon in New York City where she learned new techniques and was impressed with the physical facilities--five floors with spectacular views and legions of high-end stations and special facilities for coloring--and a very chic clientele. Zarghuna apprenticing at Bumble & bumble in New York.Zarghuna now considers herself a professional stylist. It is “her art,” she says, and her services include not just hair cutting, styling and coloring, but also makeup, nails, massage, and dress and jewelry rentals. Though she has only four chairs in each of her salons, cutting and coloring occur in the same room, and electricity and running water cannot be taken for granted, she wants all her clients to become “stylish.” She continues to confront any opposition to her services by maintaining an image in the community of a “clean,” educated and hard-working professional businesswoman. Zarghuna is changing the lives of many Afghan women, not just by making them feel beautiful and encouraging them to be healthy, but also by employing them. She trains her employees herself and dreams of having her own school for beauty services. The jobs she provides lead to a new level of freedom for her employees through a little financial independence. Beauty services are a luxury in Afghanistan--it can cost up to a month’s salary to have hair and makeup done for a wedding or special occasion. And weddings are the backbone of Zarghuna’s business, with 20 to 30 women descending on the salon for pre-celebration services. Though rural women generally perform “everyday maintenance” in the home, Zarghuna believes that the majority of women would like to come to a salon more often. 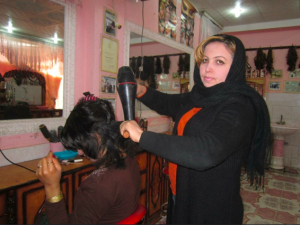 To this end, she is working to build acceptance as a reputable business owner and has developed a program about salon services for Afghan national television. “I want more people to become familiar with salon services,” she says. For 2015, Zarghuna wishes peace for her country. She hopes to keep expanding her business and will soon be employing more than 120 women--women who once suffered a lot. She hopes she will be able to help many Afghan women build their confidence and self-esteem by taking a holistic approach--addressing her clients’ emotional and physical health, and providing a space for new friendships. She hopes that her daughters will attend university, and she wants them to be liberated, free and confident, knowing it is OK to be beautiful. She also hopes her efforts will pave the way for other women.